I made you something evil with avocados. And delicious. And easy. And creamy. And garlicky. And smokey. Because the super bowl is just around the corner…or so I hear. And because I’m a guacamole lover not a hater. 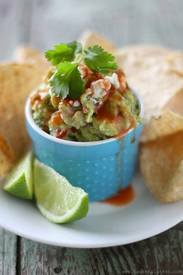 This recipe is my go-to guacamole recipe but on crack.